Is there an alternative to the 'sharp but effectual remedy'? 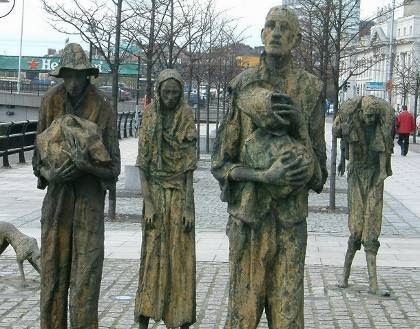 Between 1846 and 1851 about a million died of starvation and epidemic disease in the Irish potato famine. The general consensus today is that although this famine began as an extraordinary natural catastrophe, its impact was made much worse by the actions (or lack of action) of the British government, headed by the Whig Lord John Russell. As Jim Donnelly describes, there seem to be three ideologies that held the "British political élite and the middle classes in their grip, and largely determined the decisions not to adopt the possible relief measures". These were "the economic doctrines of laissez-faire, the Protestant evangelical belief in divine Providence, and the deep-dyed ethnic prejudice against the Catholic Irish". The system of agriculture in Ireland was perceived in Britain to be riddled with inefficiency and abuse. The British civil servant Charles Trevelyan, chiefly responsible for administering Irish relief policy, wrote that the famine was "the sharp but effectual remedy by which the cure is likely to be effected". There is a debate about the humanity and personal responsibility of Charles Trevelyan. Yet his actions were hardly idiosyncratic. The Lord Lieutenant of Ireland, the Earl of Clarendon, wrote a letter to prime minister Russell on 26 April 1849, expressing his feelings about lack of aid from the British House of Commons: "I do not think there is another legislature in Europe that would disregard such suffering as now exists in the west of Ireland, or coldly persist in a policy of extermination." Henry Farrell notes that the Economist magazine strongly supported the laissez-faire line pursued by Trevelyan and Russell. Were the governing elite collectively evil, as they provided armed guards for the shipping of huge quantities of grain away from the same areas affected by the blight? We could just say people act in their own interests, but as Dani Rodrik argues, this underestimates the power of ideas and ideologies. Of course the Irish famine is different in degree and form to the difficulties being faced by many in some eurozone economies. But the similarities should worry us. There is the widespread view that the inefficiencies and corruption that exist in these economies are a key factor in explaining the difficulties these countries are in. Worse still is the idea that severe austerity is necessary to ensure "structural reform" takes place to reduce these inefficiencies. There is also a common belief today that various economic processes cannot be interfered with and contracts have to be upheld, which are not very different from beliefs held by the British government in the 1840s. When the "effectual remedy" leads directly to suffering, the evidence that it does so is ignored, as a recentLancet paper, entitled "Greece's health crisis: from austerity to denialism", is happening in Greece today. It finds that "drastic reductions to municipality budgets have led to a scaling back of several activities (eg, mosquito spraying programmes), which, in combination with other factors, has allowed the re-emergence of locally transmitted malaria for the first time in 40 years." It also mentions "a 21% rise in stillbirths between 2008 and 2011 … attributed to reduced access to prenatal health services for pregnant women." Greek citizens ... are subject to one of the most radical programmes of welfare-state retrenchment in recent times, which in turn affects population health. Yet despite this clear evidence, there has been little agreement about the causal role of austerity. There is a broad consensus that the social sector in Greece was in grave need of reform, with widespread corruption, misuse of patronage, and inefficiencies, and many commentators have noted that the crisis presented an opportunity to introduce long-overdue changes. Greek government officials, and several sympathetic commentators, have argued that the introduction of the wide ranging changes and deep public-spending cuts have not damaged health and, indeed, might lead to long-term improvements. However, the scientific literature presents a different picture. In view of this detailed body of evidence for the harmful effects of austerity on health, the failure of public recognition of the issue by successive Greek governments and international agencies is remarkable. If you think that the problems in Greece and elsewhere are clearly self-inflicted, rather than the result of an act of God-like potato blight, consider this. The Greek government borrowed way too much and concealed that fact, but this was hidden from the Greek people as much as anyone else. Just because politicians are elected, does that make the people as a whole responsible for everything they do? Are they more responsible than those who lent the government this money, or in the case of other eurozone countries lent money to banks that were subsequently bailed out with no public discussion? In Victorian times, there was a belief that the debtor must be made to repay their debts whatever the hardship that this entails, and with minimal cost to the creditor. We think we live in more enlightened times today, but at least the individuals in debtor prisons normally signed the contracts they were being held to. In the case of Greece and elsewhere their leaders signed on their population’s behalf. If you say that the law must be followed, well the British government was also protecting the rule of law when it ensured that those shipments of grain left famine-stricken Ireland. Are those shipments of grain so very different from the flows of money now leaving Greece and elsewhere to pay the interest on government debt? Our attitude to famines is a little more enlightened than it was in the 1840s, but perhaps some of that enlightenment is needed elsewhere.